We all know the biblical tale…. The apocalypse is upon us when we see 4 horsemen, each one riding a horse of a different color- white, black, pale, and red. Basically, in this post, I will be talking about what the Four Horsemen are in Clash of Clans, the things you should NEVER do in this game. The 1st Horseman: Zapping DE- The worst thing you can do to a high level player (when you are a weaker player) is to snipe their Town Hall and then “zap” their dark elixir. For those of you who don’t know, “zapping” is dropping a lightning spell on a full dark elixir storage. The high level players will revenge raid you so fast, you won’t even know what hit you. Although, it might seem like a good idea (1,000 DE for 3 lightning spells), that player will take back their dark elixir with ease, possibly gaining 59 trophies while they are at it. Mostly, Town Hall 7s will do this since they want a Barb King. As a added negative, most people hate zappers, even your own clan-mates. How to avoid the Apocalypse: This one is simple. Just don’t do it. It’s much better if you wait until TH8 to get your barb king since you have will have a drill that constantly will be giving you dark elixir. The 2nd Horseman: Neglecting Walls- Although it might not seem like it, walls are actually extremely important in this game. Getting walls are part of maxing your base and too many players nowadays are going straight to the next Town Hall without even upgrading one wall. The average TH9 has level 6 walls when they can have 8s. Walls help you stop giants when you first begin playing and later in your clash career, golems. Getting level 7 walls effectively stops a single wall breaker from getting through your walls. If you watch a lot of raids with giants, the reason why they rarely get 100% is because of walls. Giants simply cannot get through walls without the help of a WB. Until you get level 7 walls, it is way too easy for anything (including goblins) to bust straight through your base. How to avoid the Apocalypse: You need to make sure you max walls! Here is a guide of Town Hall level= wall level. ALL your walls should be the level given before you upgrade. The Third Horseman: Giving out Free Positions- Now it is time to turn to clans. Giving out free elder or free co can and WILL destroy your clan. Most of the time, if someone joins your clan and asks to be promoted, they want to kick everyone out. If you see a lot of people on global saying this person is a hopper, don’t invite him/her. You should make promotions all about loyalty and donations since that makes people work hard to get promoted. Also don’t give everyone free elder/co. At some point you will have to demote these people and, naturally, they will get mad and leave. You only need a few trusted members to be the elders so they can handle a breakdown. How to avoid the Apocalypse: Don’t give free positions. Let your clan mates gain your trust, and when they have succeeded, reward them with elder. After that elder has been in the clan for a while, promote them to co-leader. The Fourth Horseman: Rushing your Town Hall- Personally, I think this is the worst of the 4 Horseman. Rushing will throw off your entire game for months. You should always max your entire base besides your heroes, troops, and walls. Rushing your Town Hall stacks clan wars against your clan. 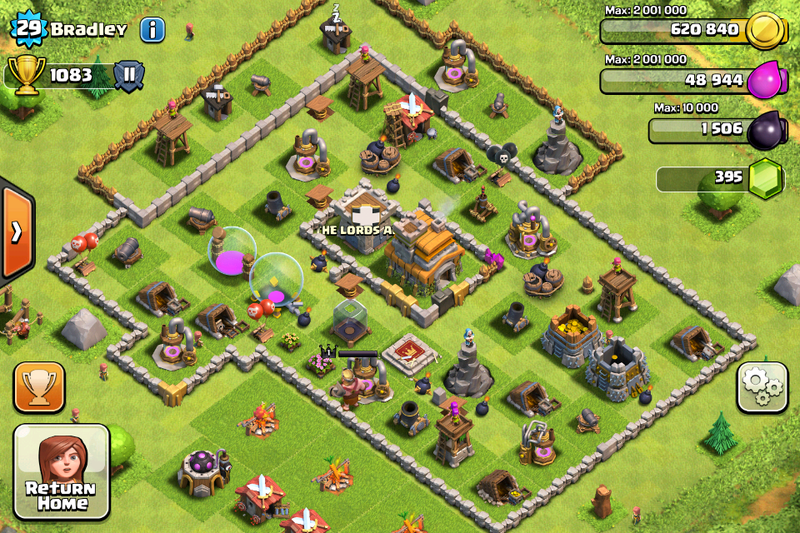 For example- Say you are Town Hall 9, level 5 walls, level 4 mortars, the works. A Town Hall 9 with level 10 walls, level 7 mortars, etc. would be the same “rank” as you when your clan looks for a match. Also loot gets weaker the higher Town Hall level you are. At TH9 it is almost impossible to get loot of TH7s while Town Hall 8s can do this with ease. Rushing also makes your base extremely easy to beat since you aren’t “mature” A maxed Town Hall 7 would fare better in a raid then a rushed Town Hall 9. The X-Bows/Infernos look juicy, but in the long run, they aren’t worth it. How to avoid the Apocalypse: You need to max your base before upgrading to the next Town Hall. Although it might seem like a pain, its actually better to do it now, when you can get more loot, than trying to do it a whole TH level higher. I hope after reading this post, I hope you guys never commit these sins. Remember- don’t zap, max your walls, don’t give out free positions, and DON’T RUSH! Let’s prevent the Apocalypse!